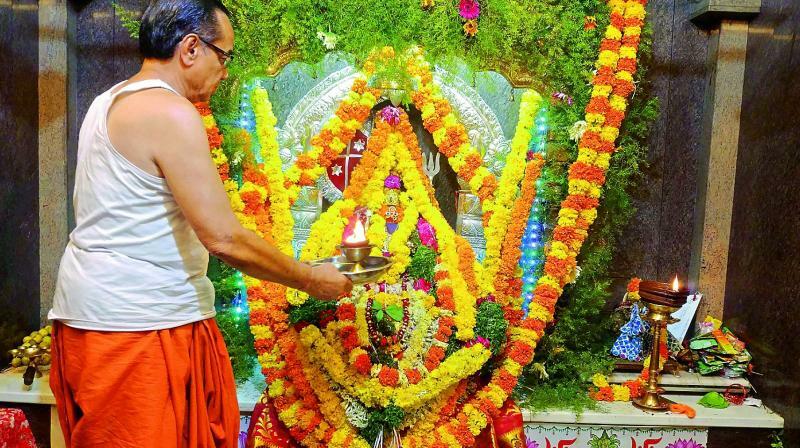 The temple priest performs rituals to the idol almost fully covered by floral decorations. Hyderabad: According to Wikipedia, “The Third Anglo–Mysore War (1790–1792) was a conflict in South India between the Kingdom of Mysore and the East India Company and its allies, including the Maratha Empire and the Nizam of Hyderabad.”The Nizam’s army was in Sholapur on the Karnataka-Hyderabad border and the commander of the army was Shambhu Prasad. After a weary day at the war, when he was resting he had a dream and Goddess Durga told him that there was a riverbed near the camp and that she was 24 feet deep on the riverbed. Next day, Shambhu Prasad went there and excavated the riverbed and found Ashta Bhuja Durga, made of panchaloha, and brought her to Hyderabad and installed her near the Musi river around 1790. In the dream he had also been told to install the Goddess near a river. So, he handed her over to Shambunathji Vyas, who was staying near the Musi river. Then it was a makeshift temple. The vigraha inside the sanctum is made of a single marble and has the entire Ram darbar carved out of this single stone. “We do not know for how long Goddess Durga was on the sands. Could have been thousands of years,” said Shantilal Vyas, the eight generation head priest of the temple. The family is from Chirpatiya village in Rajasthan. They are Shrimali Brahmins. Army chief Shambu Prasad and his wife were also devotees of Lord Rama and they built a small temple for the Lord. The vigraha inside the sanctum is made of a single marble and has the entire Ram darbar carved out of this single stone. Ironically, Shambu Prasad later converted to Islam. No one knows what happened to him and his family. Once you enter the temple premises, calmness takes over even as the breeze blows over through the several trees surrounding the temple. “Those days the Musi river was huge and flowed in full force and if we stood outside our house we could see the Golkonda Fort,” says Shantilalji. The temple stands in the same place, away from a dry and stinking the Musi river. Once you enter the temple premises, calmness takes over even as the breeze blows over through the several trees surrounding the temple. No doubt it was called a bagh. 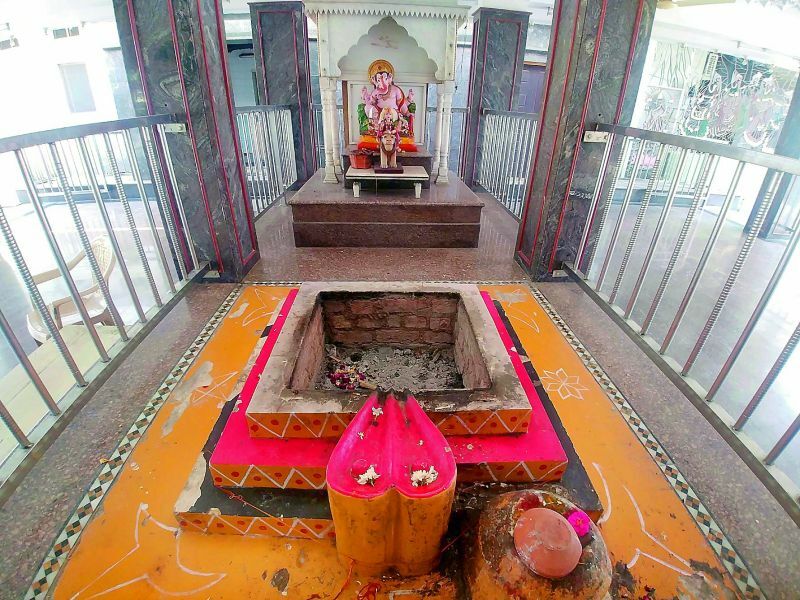 Shantilalji said that Shambunathji, the founder of the temple, was an ardent devotee of the Goddess and used to converse with her and also play Chaupat with her. Chaupat is the cross and circle game similar to Ludo. It is also historically famous because of the great epic Mahabharata where the Pandavas lost their kingdom and their glory. The Goddess felt that since Shambunathji had done so much for her, he should sit in front of her forever. There is a live samadhi in front of the sanctum sanctorum, where the founder of the temple sat in samadhi even as the structure was built around him. “There is a positive energy when you stand near the samadhi,” said the head priest of the temple. The actual idol of the Goddess is three-and-a-half feet, with her eight arms, but because of the floral decorations one is able to see only her powerful face. Colourful tiles decorate the outside of the temple. “This was surrounded by a jungle in those days and there were no lights. It was scary then,” said Shantilalji. The temple had its share of troubles when there was an attack on it during the Razakar movement. “The temple was surrounded but the head of the family, belonging to the sixth generation, Kushali Ram, and my father talked to them and calmed them down. Nothing untoward happened,” said Shantilal Vyas. Misrilal Vyas, father of Shantilal, built a proper temple for Durga in 1924, on the land donated by Kushali Ram. Then it was built in limestone in the vernacular style with pillars and a mandapam. It had seven doors. “But cracks formed, and devotees increased, so we built it in the modern style so that people could come and go,” said Shantilalji. Misrilalji passed away in 2015 at a ripe age of 103. As all temples, here too you can come with a wish and the Goddess will grant it if asked in proper faith. “The Jaiswals, Agarwals and the Kayasthas treat her as their kula devi,” said Shantilalji. After the Holi festival, a jatra is held to mark the foundation day of the temple. And immediately after Diwali on Ashtami, Annakoot or annadanam is performed. There is a small temple tank running along the temple consisting of spring water. Two halls underneath the temple were earlier used for performances and ghazal programmes. The rooms got flooded and so it stopped. Now, the tank has been covered up to keep the water clean. While some of the old structures of the temple remain as a reminder, the joint family lives in the temple premises. Dr Manoharlal Vyas, the eldest brother, is an author of several books and was a lecturer of Hindi literature at the Osmania University. He is also the founder trustee of the temple. Younger brother Kautilyaji is also involved with the temple. Shantilalji was an advocate but left the profession to take care of the temple. Shantilal’s two sons, Sitanshu and Revanth, are into event management and photography. They are also actively involved with the temple work. The daughters of the house are into medicine and teaching. The gentle rustle of the giant peepul tree and other large trees along with the wood smoke are reminiscent of days bygone. Regular visitors come at specific time and do their puja. They then have a chat with the head priest, who is the epitome of calmness and grace. Though the structure is modern, history is present and Durga’s presence all-pervading.